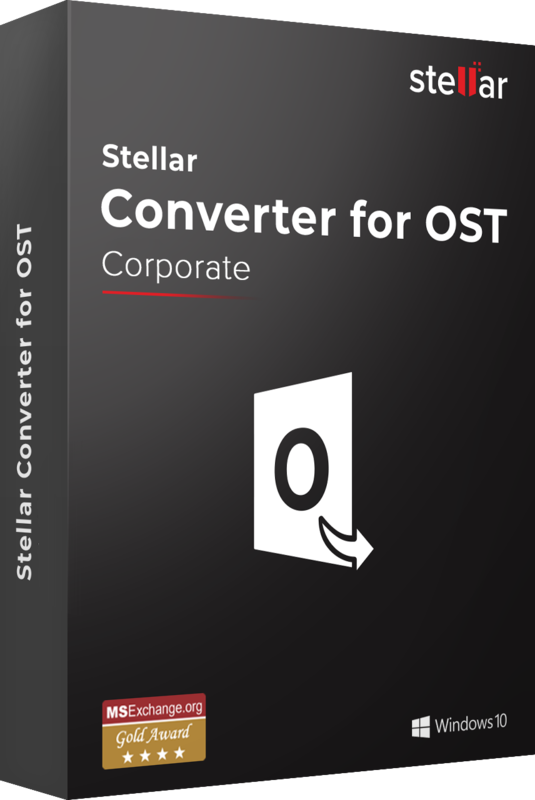 Stellar Converter for OST – Corporate is a powerful software to convert inaccessible OST files into Outlook PST files. 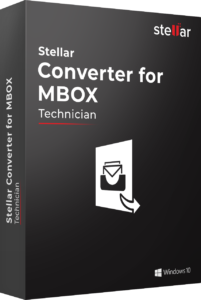 The OST conversion tool easily converts your entire mailbox components (e-mail attachments, contacts, calendars and more) to the respective PST file, in just a few clicks. 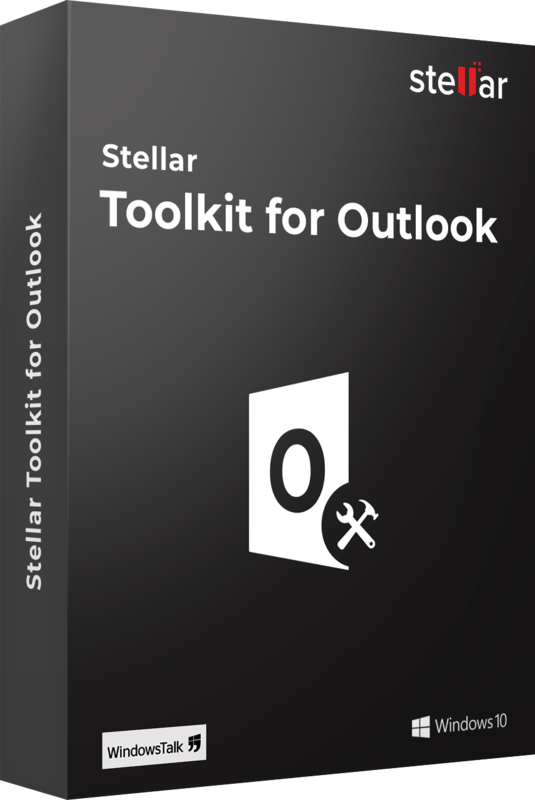 Works with all versions of Microsoft Outlook 2016, 2013, 2010, 2007, 2003, 2002, and 2000. It converts an entire OST file, or items within an OST file, into a PST without changing the original content format or structuring. 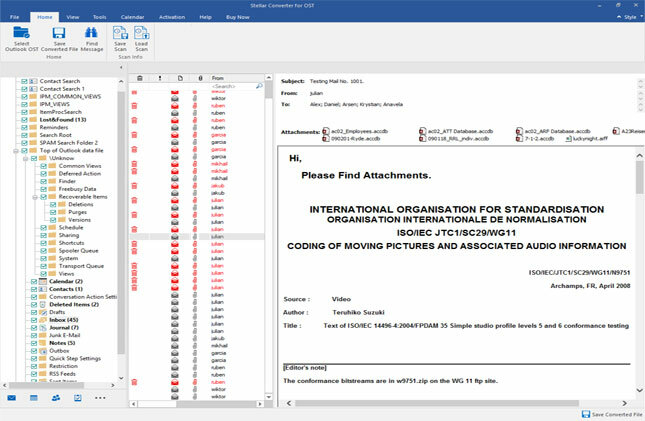 Despite the name, the tool can also export data to other formats.Once the scan is complete, the tool provides an Outlook-like user interface from where we can easily explore the OST’s contents, including searching and previewing items and attachments.As it stands, it is great! This tool easily converts objects in an OST file into PST format and exports them to a newly created PST at user-specified location. This conversion utility is one of the most competent and reliable tools that you can trust for your vital data conversions. Stellar Converter for OST is efficient in OST file conversion to its corresponding PST file in an organized and reliable way. An OST file stores a replica of your Exchange mailbox on the local system. This file lets you work seamlessly when the Exchange server experiences technical difficulties. There could be several reasons to export the data within OST file to PST format including damage / corruption of OST file, need to access OST file data on another local system, and more. This converter swiftly and smoothly extracts all data within OST files and saves them securely into a newly created PST file. 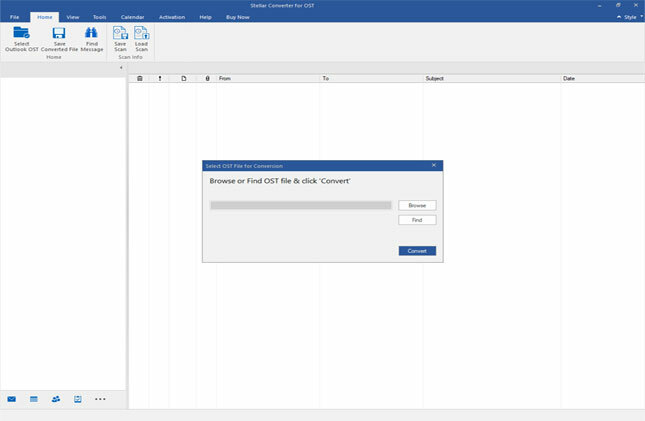 The new PST can thereafter be imported into MS Outlook to access all data. OST PST Converter Software ensures all Exchange mailbox objects like emails, contacts, attachments, notes, journals, calendar entries, etc. stored within OST files get converted into PST format. The tool considers all risk-factors and skilfully averts issues to achieve precise OST 2 PST conversion. You can make sure that all items have been converted by keeping an eye on the counter that the software displays against each mail folder were indicating the number of items converted. The Powerful OST to PST Converter Software also provides you the option to search and save individual email messages from within OST files. 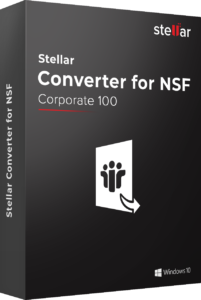 In case you do not have the time to convert all OST items into PST, you can choose specific email messages to be extracted from the OST based on various parameters such as 'To', 'From', 'Subject', and 'Date' and convert them into a variety of formats including MSG, EML, RTF, HTML, and PDF formats. This feature lends this tool a high degree of flexibility making it stand above its competition. 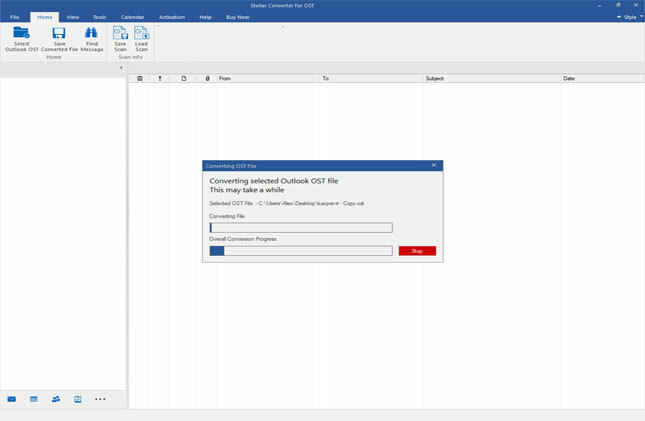 Migration to Office 365 is easier with this software as the converted OST files are exported directly on Cloud Office 365. All you need to have is Office 365 account with valid login credentials. This software relieves you from the lengthy and time-taking mailbox migration procedure. Option is available with Tech version. This feature is available in Tech Version. 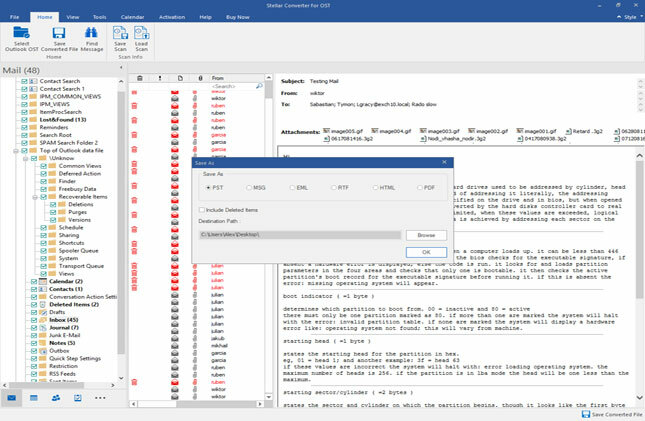 The Software provides two advanced options for new created PST file: Split & Compact. To compress the converted PST file, you just need to click on “Compact & Save PST” option and it decreases the size acquired by PST file in the disk. Another feature Split the large PST file is helpful if you have a bigger PST file and you want to break it in to smaller parts to avoid the possibilities of PST file corruption. These features are available in Tech Version. Batch Conversion procedure involves selection of as many OST files and their subsequent conversion into PST files, all at the same time, and at the same location. This option to save the corresponding PST into same location helps in tracing the PST files, with ease. An option to save at preferred location is also available. All OST files can directly converted into PST files or it can be done by splitting the PST files on the basis of either “Split by Date” or “Split by Size” option. Batch conversion process is available with Tech version.